A couple of weekends ago you might remember I bought a cute little cream chair. 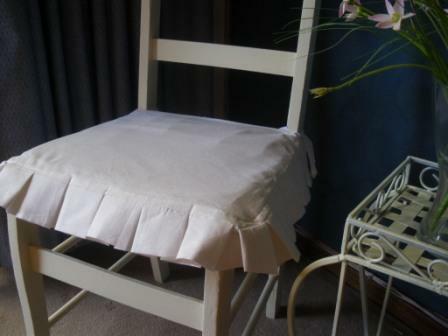 After seeing some cushions made with box pleats at the blog of Much to do with Nothing I was inspired to want to make one for my chair. It was a big ask for me as I'm a very amateur sewer but loved the look so much that was prepared to give it a bash! It wasn't without headaches as I will explain later! I happened to have quite a few metres of a white cotton fabric which was great as I needed a couple of metres in length for the pleats. As I wanted an off white colour, I coffee dyed the fabric and it turned out just the right colour. Then I cut out the seat shape and the width for the pleats. I doubled the fabric over for the pleats and ironed it down. I was now ready to pin the pleats on. All was going smoothly...had a few issues with the corners but not too bad. Once pinned on, I sewed it in place. That's where the headache started!! Can you pick from the above picture where I had gone wrong? Yes I had pinned and sewn the folded edge of the fabric to the cushion....aaaahhhh!!!! I was really frustrated with myself and was in a quandry as to whether to start all over again as I had plenty of fabric, or sit for ½ hr and unpick the tiny stitches....I made a coffee, put something good on the TV and unpicked!!! Anyway sometime later I finished it. As you can see I didn't get the corners quite right, but I'm happy enough with it. I fell in love with this outdoor seat when i was in the hardware store on Sunday. Hubby liked it too so it came home with us and has made it's home under our large Claret Ash tree. I just need to remember when our boys dogs come over to take the cushions off!! I'm quite happy with the show the pink butterflies are putting on around the birdbath at the moment. We did the same thing today-unpicking. Gotta love the person who invented the quick-un-pick. You did a fantastic job with the cushion and pleats. I'm in love with that cushion, so very pretty! I love your new bench too! The skirt for your chair turned out lovely, and the bench looks like a wonderful spot to enjoy your beautiful garden from. Love your cushion Netty you did a great job and I can see why you had to have that chair it looks great under the tree.Your garden is looking very pretty too. Good on you for persisting with the cushion when it went wrong, looks great on that chair. Lovely garden!